BHEL Bangalore Recruitment 2018 - Below are various recruitment notifications published by Bharat Heavy Electricals Limited, Bangalore / www.bhel.com. As of now, we don't have any active recruitment notification by BHEL Bangalore featured here. We may update as soon as the organization announces a new job notification. If you are looking for any information related to previously organized recruitment drives by BHEL Bangalore, you can browse through previous job notifications mentioned below and get the new updates or information you are looking for. BHEL Bangalore Recruitment 2018 - Job notification for 320 Technician Apprentices Posts in BHEL Bangalore, Bengaluru, Karnataka. 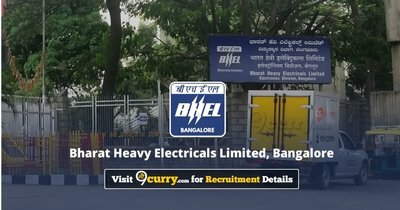 Applications are invited by Bharat Heavy Electricals Limited, Bangalore on or before 31 Oct 2018 for 320 vacancies. Diploma in Electronics & Communication Engineering/ Electrical & Electronics Engineering/ Mechanical Engineering/ Computer Science Engineering/ Mechatronics Engineering/ Civil Engineering in the years 2016/ 2017/ 2018 from recognized institution by the Government shall be eligible. Candidates should have passed the qualifying examination after 01.01.2016. Eligible candidates may send their application in prescribed format (attached below) to DGM/HR, Bharat Heavy Electricals Limited, Electronics Division, Mysuru Road, Bengaluru - 560026 by post or by email (hradmin-edn@bhel.in) on or before 31 Oct 2018, along with the relevant documents.